We know that every association is organized and structured a bit differently, which is why we've designed our chapters functionality to be flexible in the different scenarios. For organizations with chapters, it's important to be able to manage this chapter structure, allow membership applications to be tied to a chapter, provide chapter-based public website content, and send member communication at the chapter level. Our Chapters Module can do this and more. You can select a unique calendar that you wish to associate with each chapter. This makes it easy for members to view each chapter's specific events. You can select a unique List/Committee to which contacts in this chapter will belong to. Create a chapter specific list/committee to easily allow individuals to receive communications related to their chapter. You can create a unique directory to display just the contacts/organizations of this chapter. It may be useful to include it on chapter-specific web pages or in the Info Hub. You can assign a unique payment gateway to each chapter allowing the software to automatically associate that gateway with any membership invoices that are generated for that membership (e.g., when setting up a new membership, or running automated or manual upcoming billing). These membership invoices then know which payment gateway to send the payment to – wherever that invoice is paid. Regardless of the end result, you will want to start off by setting up the different chapters that you want to manage. You can do that by heading to the Chapters Module and clicking the Add button (see image below for details). Once you have your chapters set up, the rest of the setup process may depend on how your chapters are structured. See options below. The next step would be to set up your membership type. To do this, go to the Membership Module, and click the Membership Types tab. Add a new type or edit a previous one. In the Member Policies drop-down menu, make sure to select the membership policy that you just created. Once chosen, you will now see a chapter column appear in the recurring fees section (see image below). This chapters column appears only if the membership policy that was selected has the "allow chapter selection" checkbox checked. For each of the chapters you want to include, add a separate line item in the Recurring Fees section. 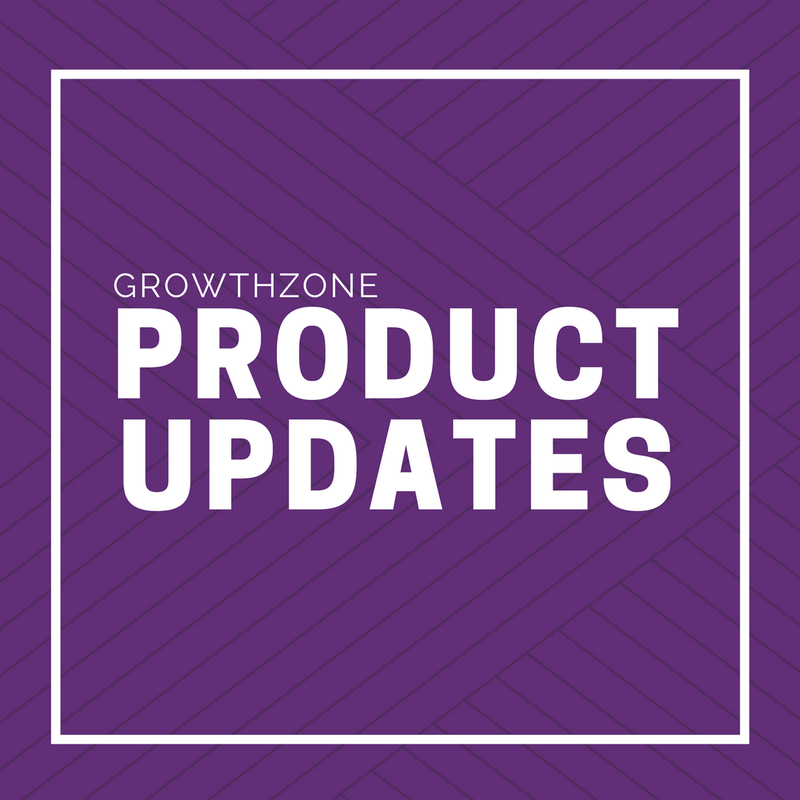 You can add the specific dues and/or fee amounts to each chapter as needed, and the chapter drop-downs that appear will pull directly from the list of chapters you originally created. With this setup type, you will be creating just one membership type with all of the chapters listed within it. If you need to gather different information depending on the chapters selected, you may need to set up using the option below. Currently, this set up method allows you to only set up one membership policy - which means one set of questions for all of the chapters. If you use chapter specific landing pages through our web content module, you will not be able to link directly to the membership application with the chapter they are coming from already pre-selected. The payment gateway need to be the same in order to have one payment at the end of the membership application. Chapters can can use one or multiple accounts as long a they are all of the same gateway. (e.g. one or multiple accounts under Stripe). In the membership application, prospective members will be presented with the chapters options as pictured below. 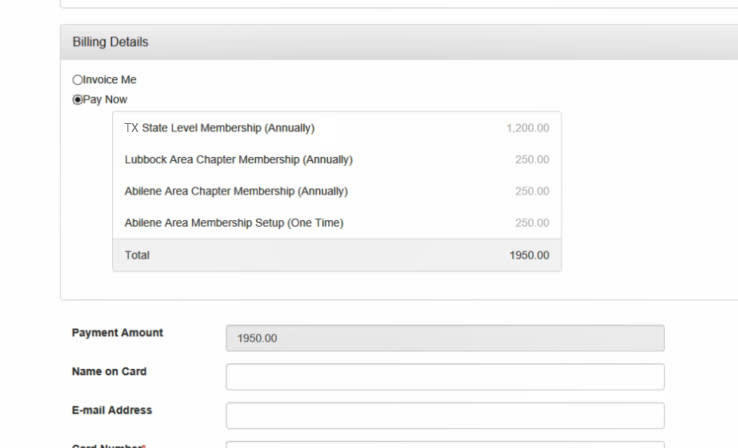 With this setup method, you will be creating a membership type for each chapter. If members are to sign up for local chapter selection and a top level selection (e.g. National or State), they will need to fill out the form twice, resulting in two payments. Consider changing to the first method of setup mentioned above.